You've been dying to get started with online reselling. I don't blame you. It's one of the best ways to start an online, work-from-home business that allows for tons of flexibility and freedom. You're a little strapped for cash! 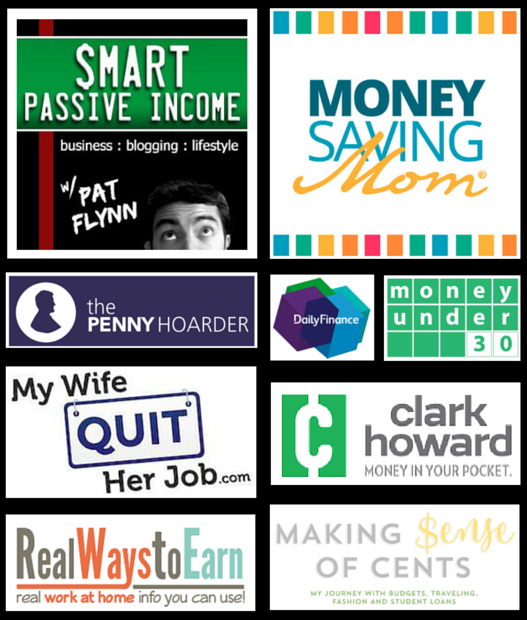 And honestly, you're not even sure that you have enough money to get your retail arbitrage business up and running. By sourcing your inventory at thrift stores, flea markets, and yard sales. 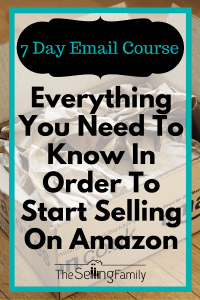 It's actually how I got started selling online (long before I knew what Amazon FBA was)! And even though it's not my main sourcing strategy today, it's still a great way to start or supplement an online reselling business. Thrift store flips are also perfect for sellers who love the thrill of the hunt. If you're a total ROI junkie, then what's better than buying inventory for $3, $5, or $10 and reselling online for $50-$100?! No problem. There are other business models that might work for you. But if you are low on funds and up for a fun challenge, thrift store flips might be perfect for you! Stick around and I'll share everything you need to know to get started with sourcing at thrifts. It's a little different than “regular” Retail Arbitrage, so I want you to have all of the details! Have you had a chance to watch the Netflix show Tidying Up with Marie Kondo yet? I've been through a few episodes and have even done some cleaning out around the house. According to my Facebook feed…so has everyone else! I've seen memes, blog posts, and even news stories and interviews all about people who are finally getting rid of stuff that no longer sparks joy. Turns out when we all started watching the show, we also started hauling our things to Goodwill and other thrifts. A lot of people don't know this, but you can buy inventory at thrift stores and resell it on Amazon or eBay for a profit. You can start with the big stores and then explore from there. Most parts of the country have major thrift store chains like Goodwill, The Salvation Army, and Savers. These big chains have fast turnover so you can always find something new. They're also more likely to get overstock items from major retailers like Target. This can make them a good spot to snag new in package items. But these aren't the only thrift stores so don't stop there! Different regions, states, and cities will all have their own independent thrift stores, too. Turnover might be slower, but there may also be fewer people shopping these deals. Prices may also be lower than at the bigger thrift chains. These small shops are also less likely to have an online presence. Goodwill, for example, actually sells a lot of their donations online (including on Amazon). You can always turn to Google for store ideas and Craigslist for yard sale dates. Pick a few stores that look promising, grab your scanner, and hit the road for a day of thrifting! When I'm doing retail arbitrage, online arbitrage, or even liquidation sourcing, I'm typically looking for New items. But when I'm out at thrift stores and yard sales, I'm actually looking for both new and used items. You'd be surprised by the number of new in package items that I've found on the dusty shelves of thrift stores. I think it's really common for people to donate unused gifts or gadgets. And now that everyone's watching Tidying Up, I think even more people are getting rid of things that they no longer need. 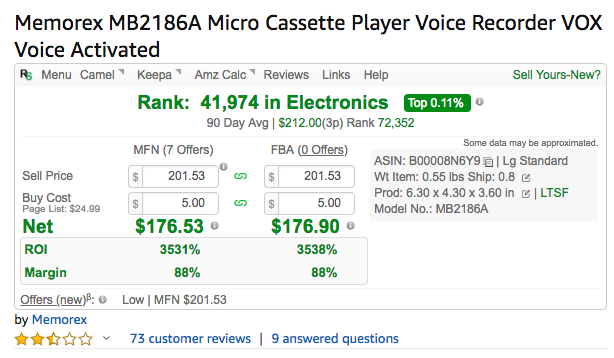 If you're selling on Amazon, remember that something sold in “New” condition should include the original packaging (with very few exceptions). You can review Amazon's Condition Guidelines here. With that in mind, here are some examples of the kinds of items I'm looking for at thrift stores and yard sales that work for online reselling. Don't treat these as BOLOs, as some of these were found years ago when I was spending more time in thrifts! Most thrift stores will have a pretty large selection of kitchen and cooking items. Once you get past all the glassware (you know, the same sets that your grandma had! ), you'll likely find some kitchen gadgets. I found this Presto Salad Shooter Pro multiple times. I got one new in the box for just $7 and sold in New on Amazon for $45. Looks like this is still going for a good price today! When I would find them without the original box, I could still sell them on eBay for about $25. Not bad! This is one of my favorite categories to look for! You might spot an item that looks technologically ancient (you know, from like 2004) and think it's lost its value. But some people pay BIG money for discontinued items for office use. I paid $5 for this and sold it for $189. It looks like the price has gone up a little since then, actually! Here's something that's not quite as profitable, but is still the perfect example of the kinds of “ordinary” items that other sellers overlook. 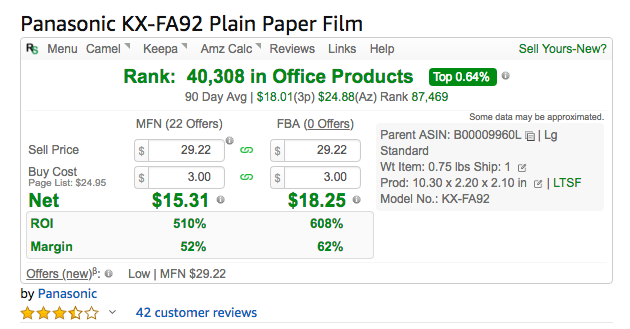 I bought this fax paper film for $3. This is the kind of thing that is getting harder to find in retail stores but people still need it! I sold mine for $25 and it looks like that price has held and even gone up a little. Looking for games at thrift stores is super fun! You will see games that you remember from being a kid and you will see games that you have never even heard of. The weirder the better really! I found this game (called “The Ungame” oddly enough) new in shrinkwrap for just $3. It sold really fast for around $19! If you enjoy shopping for new (and used) board games, my friend Stephen Smotherman has the ultimate guide to board game flips. 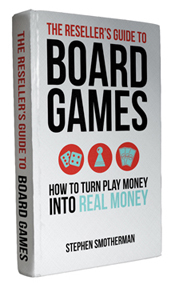 His book + video training The Reseller's Guide to Board Games (How to Turn Play Money into Real Money) will teach you everything you need to know about sourcing and selling games on Amazon and eBay. Stephen updates this material often (updates are free to you!) and even includes some awesome bonuses like Board Game BOLOs. Plus, because he has so much board game experience, he can break down tricky topics like condition notes for Collectibles, finding missing pieces online, and advanced pricing strategies. Check it out if you want to add board games as a cheap (and fun!) inventory source. While it's great to discover new in package items at thrift stores, don't rule out Used items! Just because an item is missing its original packaging doesn't mean you can't make a decent profit on it. 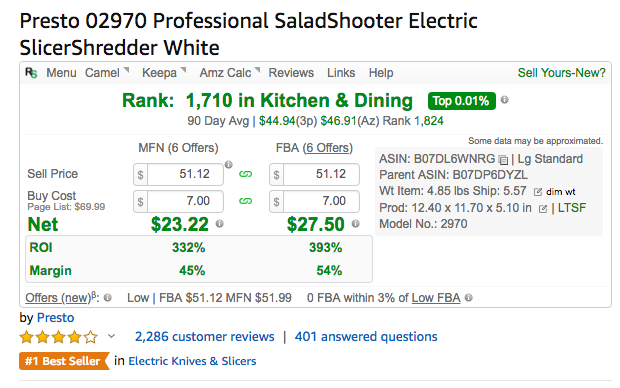 I already mentioned with the Salad Shooter that when I was finding them without boxes, I was selling them on eBay. eBay is a great option for used items because you can take your own photos and really show the buyer what they're getting. But Amazon has plenty of categories where it's perfectly fine to sell items in Used or Collectible condition. You just need to be very familiar with the Condition Guidelines and grade your products accordingly. Don't waste your time scanning fiction. Focus on textbooks, self-help, and other nonfiction topics. Amazon doesn't allow you to sell toys in “used” condition, but you can list certain toys as Collectible. Amazon says that a collectible toy “must be rare, exclusive, one-of-a-kind, or otherwise unique.” If you find a used toy at a thrift that doesn't quite meet that criteria, you can always sell on eBay. 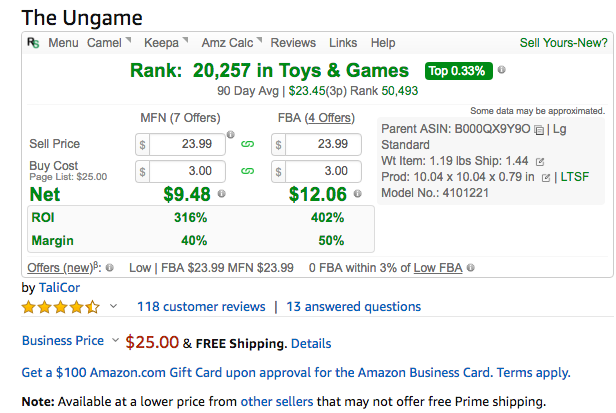 Collectible board games are pretty popular on Amazon. Just be sure to check for missing pieces or instructions. If you're thinking about selling used or open-box games and toys, I'd again highly recommend checking out The Reseller's Guide to Board Games. I know this is a pretty broad category, but don't skip an item just because it's missing a box (or has damaged packaging). Here's an item I purchased at a large thrift store for $4.99. It is a TV Guardian. You know, one of those old school boxes you can put on the TV that will filter out the bad language during regular TV. The one that I found was still in the original box, with the original instructions included. It was used but in Very Good condition. At the time, it was ranked 700,000 in Books (so, not even in the right category!). But it only cost me $5 so I didn't mind listing it and waiting. 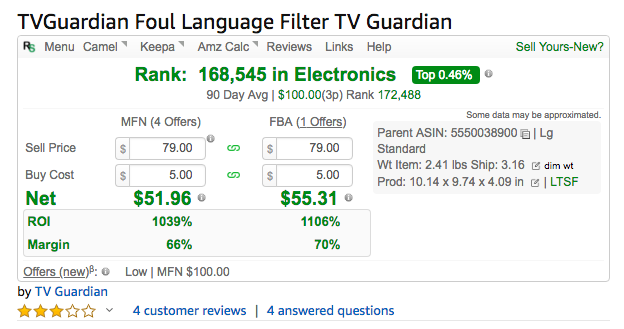 I originally listed the TV Guardian in Used - Very Good condition for $89. But after a couple of weeks, I lowered the price to $79 to try to get the sale. It sold very quickly at that point and I was still really happy with the profit I made! This is a great example of the kinds of items people usually skip because they're 1) Used and 2) very outdated technology. Because I took the time to scan it, I made a profit of $55! Selling thrift store finds on eBay was actually how I got my start as a reseller. 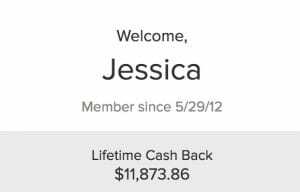 I ultimately switched to Amazon FBA for convenience and growth. As a result, I spent less time looking for one-off treasures at thrift stores and spent more time buying multiples in major retail stores and online. 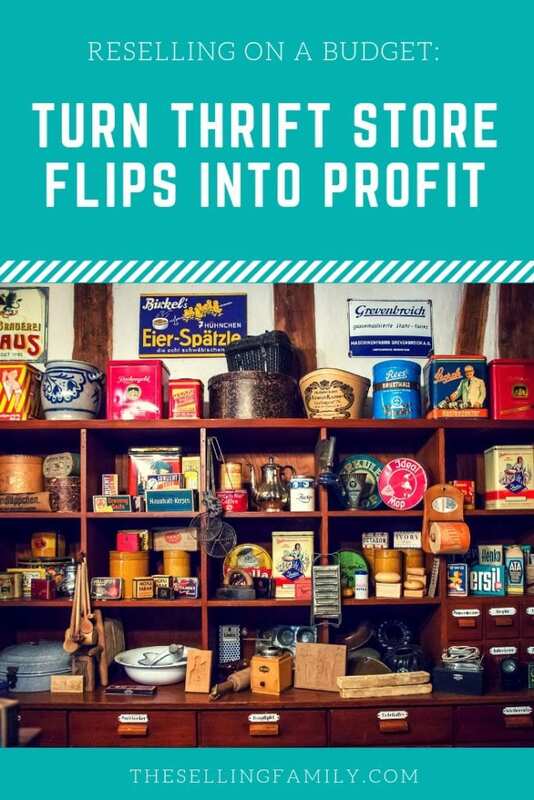 But when you're getting started with thrift store flips, both eBay and Amazon FBA are viable options. A lot of thrifters choose eBay because the fees are lower and there aren't as many restrictions on Used items. Or maybe you already have a presence on eBay and you'd like to stick with it. This is definitely something that can be profitable! Rob and Melissa are a husband and wife team who have made more than $100,000/year selling thrift store flips on eBay. Check out some of their flips from last year! You can enroll today at Flipper University and be up and running as a thrift store flipper in no time. I really recommend it for anyone who wants to learn the best way to flip thrift store finds on eBay. If you're interested in sourcing at thrift stores but you'd rather not deal with shipping costs, customer service, and eBay seller feedback, you might prefer to sell your items on Amazon's marketplace through their Fulfilled by Amazon program. If you want to learn how to build a profitable Amazon FBA business from the ground up, take a look at my Amazon Boot Camp. 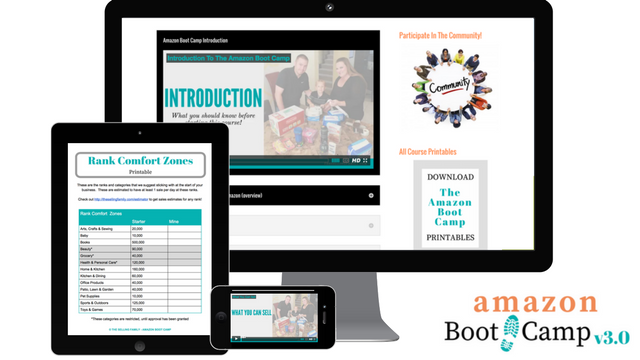 In the Boot Camp, I'll walk you step-by-step through the entire process of creating your account, sourcing your first products (at retail stores or thrifts), and creating your first Amazon shipment. It's hard to go wrong when you're sourcing at thrift stores. With a little patience and an even smaller budget, you can make big profits and off-the-charts ROI! Thrift stores, yard sales, and flea markets make the perfect sourcing stops for new sellers on a budget. If you want to test the waters of Amazon or eBay selling, there's no reason not to head to some neighborhood thrifts and start looking. Who knows what hidden treasures you might find in your local thrift store! Alright, now for my absolute favorite part of thrift store flips: hearing your thrifting success stories! Tell me: what's the best product you've ever found in a thrift store? I want to hear about it in the comments. If you've never sourced at a thrift before, take the thrift store challenge. Hit at least three thrifts this week and tell me what you found!